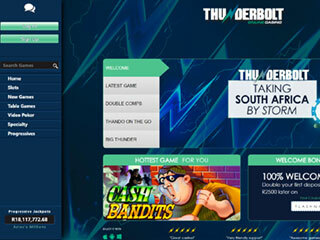 The Thunderbolt Casino offers a unique South African flavor that gives South African gamers a home-grown casino that they can access on any PC or mobile gaming device. You can learn more about how you can play your favorite casino games, enjoy plenty of free bonus codes, and win real money prizes when you read the Thunderbolt online casino review. Check out our exclusive bonus codes below just for SPC visitors! Enjoy the Easter Weekend at Thunderbolt Casino! April 7 to April 22! Get up to R9000 in matching deposit bonuses!! And another R300 absolutely free – no deposit required! In 1994 South Africa legalized casino gambling. Since that time, increasing numbers of players throughout the country have taken advantage of the opportunity to enjoy casino entertainment at casino venues located in Johannesburg, Worchester, Newcastle, Queenstown, Pretoria, Capetown and other areas. Until recently, gambling at the casino involved travel, time taken from work, finding accommodations and locating tables with limits that fit your budget. For these and other reasons, players in South Africa often decided that it wasn’t worthwhile for them to compete at the casino. Now, however, everyone can enjoy the fun and excitement of casino entertainment when they click into South Africa’s online casino and play any time and from any location. There are multiple online casinos in South Africa. Casino advisors suggest that players read the casino reviews to find out which online casinos offer the kind of gambling event that fits their personal expectations. This Thunderbolt Casino Review will give you an overview of one of the top South African casinos. There’s information about the casino’s games, bonuses, technology and more so you can make the best decision for your personal gaming needs. Regardless of whether you love the classic casino games or prefer high-speed slot machines or fast win lotteries you’ll find it all at the Thunderbolt casino. In the slots room there are three-reel classic slot machines that are perfect for beginning players. Gamers who have more experience and skill will enjoy the five-reel video slots where free spins rounds, Gamble Games, expanding reels and wild systems can be round. The casino also presents a large selection of card games and classic casino table games including roulette, poker, blackjack and many variations of these traditional game. You can select a low-stakes game for pennies a spin or move to a high stakes game where you have the chance to place large wagers and compete for the chance to win lucrative payouts. Play games for free for fun or play for cash rewards. Or, compete in both the Free Mode and the Real Mode! Some of the Thunderbolt casino’s most innovative game options include Roaring 20s Bingo and the Red Dog card specalty game. There are popular variations of Blackjack such as Let ‘Em Ride Blackjack and Match Play 21 plus one, three, ten, fifty-two and one-hundred hand poker for poker enthusiasts. If you thrill to competitions that allow you to vie against other players, select one of the progressive jackpot games and place your progressive jackpot deposit. Every player places their progressive bet on the game. Everyone plays the game as usual and continues to collect all the regular game wins and bonus wins. The progressive jackpot of each game is comprised of all of all of the participating players’ deposits. If your spin results in triggering the progressive jackpot you’ll take home the entire prize amount of hundreds of thousands – even millions – of rand. Thunderbolt offers top casino bonuses. Whereas South African land-based casinos pay out bonuses in the form of hotel discounts and restaurant vouchers, online gamers collect their bonus points, credits, cash and free spins in the form of real money gifts! All of these Thunderbolt promotional casino bonus codes allow you to play more games for more time for free while you collect your winnings as real cash payouts! 50 free spins on the Panda Magic slot machine as a welcome bonus. 25% Cashback every time that you deposit without involving another bonus give-away. Thursday bonus of 150%, worth up to 1500 rand. Comp points that are gifted to you based on your casino activity — you accumulate these extra gaming points and can then use them on any game that you want. Friday Facebook bonus of Friday free spins via the casino’s Facebook page. More Friday bonus excitement of 100 free spins and a 250% match bonus for VIP players — good when you make one deposit of 500 at any time during the week. There are also monthly boosts, Monday bonuses, a midweek special, midweek spins, a mobile bonus for mobile gamers and more! Thunderbolt Casino utilizes the latest firewalls and the most advanced 128-encryption codes to guarantee that casino patrons will enjoy top security with protected passwords and usernames. The casino is powered by the industry giant RealTime Gaming. 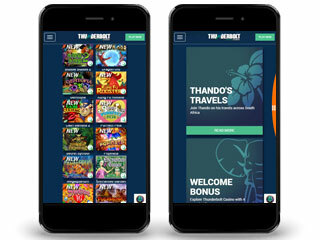 The gaming designer creates casino software that makes it easy and user-friendly to play on any PC or mobile device. 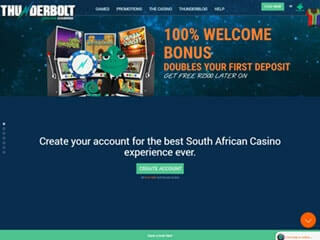 You can create your free account at Thunderbolt when you click on the “Sign Up” button on the casino’s home page. Be sure to use one (or more) of our casino bonus codes offered below. These are special bonus codes just for SPC visitors. Follow the prompts to submit your name and email address and then select your unique username and password. At Thunderbolt, your username will be the name by which you are known during your gaming activities. Put in your bonus code and your on your way – enjoying free bonus money or free spins. You can play in the Free Mode to play for free at any time. When you’re ready to play for cash rewards, link your online bank account to the casino, make a deposit and use the money in your casino account to make individual deposits on your preferred games. You can withdraw your winnings into your personal account whenever you’re ready. To link your online bank account to Thunderbolt, submit a proof of identification (driving license, passport or color ID) and proof of your residential address (utility bill). If you’re going to pay by credit card, submit photocopies of your credit card (front and back) as well as a credit card authorization form. You can also use any of the casino-supported ewallet banking options which include Neteller, Skrill, ECOPayz, EASYEFT and SID Easy EFT. Thunderbolt also supports Bitcoins which you can use via Neteller’s Obit Bitcoin. The Thunderbolt customer service line is available 24/7 to help you with any questions relating to the games, navigational tools or banking issues. The customer service representative can also help you link your casino account to your land-based bank account. For assistance, call at 0-800-980-320, write an email to support@thunderboltcasino.com or chat by pressing the “Chat” button on the casino’s support page at https://www.thunderboltcasino.com/support. Thunderbolt Casino has a lot going for it. It’s SA oriented so they’re fully equipped to operate in Rand. They’ve got a good selection of games. But what most stands out is the visual set up of the casino. It’s nicely set up, with comfortable, simple navigation, a soothing turquoise motif and the best part? Thando, the mascot! He’s a cute little guy – of the lizard family – who accompanies you around the casino making sure you’re updated on everything going on. But let’s be sure to mention the promotions – TONS of them! There is always some bonus action going on at Thunderstruck. And Thando is there to help you take advantage of every single perk!